On the off chance that someone sees this post--anyone have this pattern? 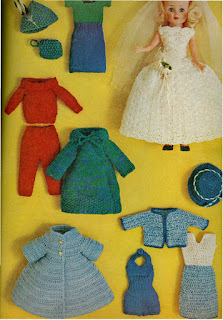 It was published in the 1960s and was available via mail order through McCall's craft magazine. The patterns fit 10 1/2 inch dolls, like Toni, and is both knit and crochet, numbered 558-NB, and had the word "trousseau" in the advertisement. I've seen a few older posts online searching for this as well. There may even be a 2nd page of photos--I'd have to go looking for that. Anyhow, if you have this I would love to hear from you at yarncraft@mail2teacher.com. Thanks. Please use SEARCH THIS BLOG for useful information. It is always a while between posts, but what is here may be of use to you. While meant to be informative...I hope to occasionally entertain you. Crocheting since 1976, knitting since 2000 (tho I learned the summer I was 6). Certified to teach each, beginner/advanced. I love that "aha" moment people realize they CAN make something with yarn/sticks/hooks. I am always trying to find/learn ways to express myself. Working wife and mom.